Pull into the diner in Andrea’s go-kart and catch the latest movie! 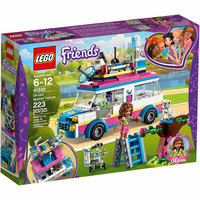 The LEGO® Friends 41349 Drifting Diner has a burger grill, takeout window with cash register, stylized car-shaped table with bench, and an amazing giant burger icon on the roof. Outside there’s a giant screen for drive-in movies with handy side tables—stand your own cell phone or tablet in front of the movie screen to play real videos for the mini-dolls. Hang out with Emma and Zobo at LEGO® Friends Olivia’s hi-tech Cupcake Café Technology and food combine at the LEGO® Friends 41366 Olivia’s Cupcake Café with lots of super-cool gadgets for imaginative kids’ role-play. Inspired by the sushi restaurants of Heartlake City’s tech district, the cupcake shop features a server that rotates using gear wheels. The LEGO Friends Cupcake Café also has a cool cupcake-dispensing machine, indoor and outdoor dining areas. Get ready for a day of showjumping at Stephanie’s toy horse stable! 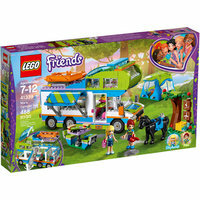 Play at being a showjumping champion with LEGO® Friends 41567 Stephanie’s Horse Jumping set. Before the contest lovingly wash and prepare the horses at the toy horse stable. Once the competition starts ride around the course, navigating the horse jump toys and taking care not to knock off the rails. Spectators can take in the action and enjoy a drink from the viewing balcony. Play out endless stories with these LEGO® friendship heart boxes! 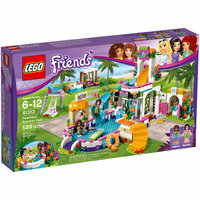 LEGO® Friends 41359 Heart Box Friendship Pack is the ideal gift for children who love imaginative play. This set features 2 buildable heart boxes, large and small, for our friends Vicky and Olivia. As one girl reads a story, help the other act out the plot using the dress-up sets. The multitude of accessories help with the role-play—pretend you're a pirate, or maybe solving a crime with the police. Drive the cool, tipping tow truck to keep Olivia’s go-kart in tip-top shape! 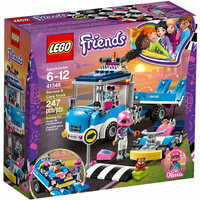 Olivia is always ready to rescue her racing friends with the LEGO® Friends Service & Care Truck. Lower the ramp and use the rope and winch to pull the go-kart onto the tow truck and transport it to the workshop area. Raise the go-kart up and check all is well underneath. This speedy LEGO Friends set also includes a go-kart launcher, a mini-doll figure, plus robot and hamster figures. Try out all the latest fashions at Andrea’s Accessories Store. Browse the displays at LEGO® Friends 41344 Andrea’s Accessories Store, including a wig, textile skirt, handbag, hair bows and perfume. The fitting room with mirror spins around to reveal Andrea’s new look to her friend. This fun fashion shop set also includes a sewing machine, cash register, loudspeakers and a stand for Dexter the dog. Stage an epic go-kart race around Heartlake City! LEGO® Friends 41352 The Big Race Day sets the scene for an exciting go-kart race between the friends from Heartlake City. The main race building features a downstairs changing room with lockers and a restroom, while upstairs there’s a winner’s podium and VIP lounge for all the Heartlake City pets to watch the race. Practice makes perfect in Andrea’s musical bedroom! LEGO® Friends 41341 Andrea’s Bedroom is set on a yellow heart-shaped base and perfectly reflects Andrea’s love of music and performing. Her bed folds up into her closet to create a dressing area or room to rehearse with her pet parrot. She also has a piano, guitar, speaker, lamp and a laptop for mixing her own tracks. Includes a mini-doll figure and a parrot figure. Create and customize cool go-karts for the Heartlake City friends! The LEGO® Friends 41351 Creative Tuning Shop features a showroom with sliding door function and revolving floor, lifting workshop platform, opening tool drawers and an upstairs office. This LEGO Friends set also comes with 2 go-karts plus lots of extra pieces to create and customize them in all sorts of ways. Take flight with Olivia in her vintage-style propeller airplane! 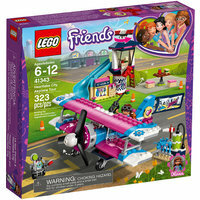 LEGO® Friends 41343 Heartlake City Airplane Tour includes a pink and blue vintage plane with turning propeller and space to seat Olivia, her robot Zobo and her hamster Rumble. There’s also an air traffic control tower with a ladder and slide, a refueling station and a snack table with stools to ensure both plane and pilot are ready to fly! Showcase your talents with LEGO® Friends Andrea! It’s showtime with LEGO® Friends 41368 Andrea’s Talent Show. This set features 3 different rotating stage sets for hours of creative play displaying Andrea’s talents. Get her ready in the dressing room, then on stage, help her sing, play drums or perform magic—twist the knob on the clever box to make a bunny appear! The 2 speakers at the side of the stage rotate to reveal big screens.